On Shabbat, there are certain types of knots that one may tie or untie and some that one may not tie or untie. See below for details and practical applications. Where was it in the Mishkan? The gemara explains that Koshair was performed in the construction of the Mishkan by the trappers of chilazon who would tie knots in their nets in order to adjust their nets. Definition: There is an important machlokes Rishonim as to the definition of a knot that would warrant a chiyuv min hatorah. According to Rashi and Rosh, as long as the knot is intended to stay tied forever or for a long time, one is chayav min hatorah for tying it. According to Rambam and Rif, not only must one intend to keep it tied for a long time to be chayav min hatorah, it must also be defined as a kesher uman - professional knot, such as a sailor’s or camel-driver’s knot. Permanence:There are different opinions as to what constitutes a ‘long time.’ The Kol Bo says that a knot that is tied for more than one day is called somewhat permanent, and it is rabbinically forbidden to tie. The Tur and Mordechai say that a knot that is tied for more than seven days is permanent. Rabbeinu Yerucham says that only a knot that is tied for half a year or a year is considered permanent. Many Rishonim hold that it is rabbinically forbidden to tie a knot which is either professional or meant to last for more than 24 hours. Some Sephardim hold that a non-professional knot is only rabbinically forbidden if it meant to last a week. Some Rishonim hold that a knot which is permanent even if it's not professional is Biblical prohibited. The rules of untying are parallel to the rules for tying. Thus, any not that is permitted to tie is also permitted to untie. According to some opinions, matir only applies if you are untying with intention to re-tie a better knot. Others disagree. A bow-knot, slipknot, or a single-knot isn’t a true Kesher-bind and is permissible even if it does remain in place for a while. For example: a ribbon on a gift, a single bind on a shopping bag or garbage liner. ↑ As cited in Rema 317:1. Tur in 317 says that a knot is only permanent enough to be chayav chatas if it is able to be kept forever, but a knot meant to last seven days is patur aval assur. According to Rashi, (Gemara Shabbat 112a), tying a knot that lasts forever is forbidden Deoritta, tying a knot that is untied after some time is forbidden Derabbanan, and tying a knot that is untied all the time is permitted. (For a precise explanation of Rashi see Bet Yosef 317:1 and Taz 317:1.) The Rosh 15:1 agrees. The Rif 41b, however, explains that a professional knot which is meant to last forever is forbidden Deoritta, a non-professional knot which is meant to last is forbidden Derabbanan, and a non-professional knot which is not meant to last is permitted. The Rambam 10:2 adds that a professional knot which is not meant to last is forbidden Derabbanan. S”A 317:1 and Yalkut Yosef 317:1-4 rule like the Rif, while the Rama and Mishna Brurah 317:5 and 14 are concerned both for Rashi and the Rif. Pri Megadim M”Z 317:3 and Mishna Brurah 317:5 writes that according to the Rambam even if it lasts a long time it’s permitted as long as it is not meant to last forever. The Bet Yosef 317:1 explains based on the Tur that a knot that lasts for less than a week is considered to be untied every day. Yalkut Yosef (vol 2 p. 555) agrees. Rama 317:1, however, quotes the Maharam MiRotenburg’s who says that a knot that lasts for more than a day is forbidden. Pri Megadim (E”A 317:2) and Mishna Brurah 317:6 clarify that one day means 24 hours. Sh”t Yabia Omer 8:39:8 agrees that one day means 24 hours for this halacha, unlike the Tal Orot who says that it goes by the halachic day. Taz 317:1, Eliyah Rabba 317:2 Aruch HaShulchan 317:8, and Kaf HaChaim 317:14 rule like the Maharam. ↑ The Rama 317:1 quoting Tur and Mordechai; Mishna Brurah (317:6) explains it as anything less than 24 hours. ↑ Rama also quotes Kol Bo and Hagahot Maymoniyot. Chazon Ovadia Shabbat Part 5 page 47 and Yalkut Yosef (317:6) writes that Sephardim hold like this opinion. ↑ Shemirat Shabbat KeHilchata 15:50 (in new editions 15:53), Kesot HaShulchan (Siman 123, at the end of note 4), Sh"t Az Nidabru 3:22, Sh"t Bear Moshe 6:3. Kesot HaShulchan (v. 5 p. 56) explains that in his opinion a loose knot isn't a knot on a Torah level and tightening it is creating a knot. Additionallyת according to some opinions bringing the two knots that were very much separated together even though they remain loose is also considered creating a knot. See there for his discussion. ↑ Mishna 111b, Rambam Shabbos 10:7, Rama 317:1, Mishna Brura 317:7, Chazon Ovadia (Shabbat vol. 5, p. 47). ↑ Tosfos Shabbos 73a “Hakoshair”, Biur Halacha 317:1 “‘Dino’”. See 39 Melochos v. 3, p. 786, fn. 2. ↑ Rashi (74b “Shari”), see 39 Melochos, pg. 805. ↑ Shulchan Aruch (317:5) and implied by Rama (317:1). Kitzur Shulchan Aruch 80:45 and Yalkut Yosef (317:11) agree. ↑ 39 Melachos (Rabbi Ribiat, vol 3, pg 798) writes that it is forbidden as his definitive ruling, but in the footnote 49a he admits that since it is easy to undo he doesn't know why one should be strict. Rambam 10:5, Tur, and S”A 317:5 rule like Chachamim on Shabbat 113a who hold that tying a bow is permitted. Bet Yosef 317:5 quotes the Mordechai, who forbids tying a bow on top of a single knot. However, Darkei Moshe 317:3 quotes the Agur who says that the minhag is lenient to tie a bow on top of a single knot. Magen Avraham 317:15, Taz 317:7, Eliyah Rabba 317:13, Mishna Brurah 317:29, and Kaf HaChaim 317:59 rule like the Agur but explain that it must be untied within 24 hours so that it is not considered a permanent knot. The Aruch HaShulchan 317:25, however, rules like the Mordechai. Kitzur Shulchan Aruch 80:45, Shemirat Shabbat KeHilchata 15:53 (in new edition 15:56), and the Shabbos Home (Rabbi Simcha Cohen, vol 1, chap 13, pg 207) concur with the Mishna Brurah. Birkei Yosef 317:2 argues that the Agur was lenient even if the bow-knot is permanent. Yalkut Yosef (Shabbat, vol 2, p. 562) agrees. ↑ Yalkut Yosef (317:11), Rav Ovadyah in Kol Sinai (Koshair #5). See previous two footnotes. ↑ Sh"t Tzitz Eliezer 7:29, Shalmat Chaim 185, Beir Moshe 6:55. ↑ Shemirat Shabbat KeHilchata 15:53 (in new editions 15:56) is strict unless one is planning to untie it within 24 hours, however, in the footnote (15:188) he quotes Rav Shlomo Zalman who said that the minhag is to be lenient. 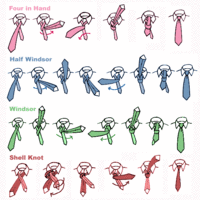 For diagrams of the different ways to make a tie, click on the image to the right. Shemirat Shabbat KeHilchata 15:58 quotes Rav Shlomo Zalman as permitting tying a necktie on Shabbat if it is “not tied as a knot” (to be explained) and meant to be undone in 24 hours because it is like a bow on top of a single knot. He adds that if one doesn't usually untie it within 24 hours, one should tie it before Shabbat and put it on and take it off by tightening and loosening it. The English translation of Shemirat Shabbat KeHilchata explains “not tied as a knot” as a tie which would become undone if the narrow end is pulled out. The new edition of Shemirat Shabbat KeHilchata 15:62, however, writes that it is permitted to tie a necktie on Shabbat if one usually unties it within 24 hours and does not have any other stipulations. Yalkut Yosef (vol 2, p. 562), however, writes that for Sephardim, it’s permitted to tie a necktie if it is going to be untied within a week. Rav Moshe Feinstein (cited by 39 Melachos, footnote #42), Rabbi Eliezer Waldenburg (cited by Shabbat VeHilchoteha p. 221), Menuchat Ahava (vol 3, 14:13), and Or Letzion 2:47:21 permit tying a necktie and don’t specify which type. Rabbi Mordechai Willig (“Hilchos Shabbat 5761 Kosher#1” min 90-4) says that even according to those who consider a tie to be a knot, it is permitted to make a tie if one has intent to undo it within 24 hours. This is even true for a person who usually leaves their tie tied. Although the Beiur Halacha s.v. HaKosher writes that one’s personal intent to undo it within 24 hours is ineffective when the way of the world is to leave a knot tied, Rabbi Willig explained that this case is not similar because some do untie their ties everyday. The 39 Melachos (footnote #41) has the same idea. Shabbos Home (p. 221) writes that if the tie is totally undone by pulling out the narrow end (“Four in Hand”) it may be tied forever, and if it isn’t totally undone when narrow end is pulled out (“Windsor”), some permit tying it forever, and some say it’s only permitted if one intends to undo it within 24 hours. Orchot Shabbat (vol 1, p. 338) argues that the first type (“Four in Hand”) is only permitted if one intends to untie in within 24 hours, but the second type (“Windsor”) is questionable. See Torat HaMelachot (p. 79-80) quotes Rav Nissim Karelitz as permitting a “full-Windsor” knot but forbidding a “four in hand”. See Chut Shani (vol 2, p. 227). ↑ Shemirat Shabbat KeHilchata (in the new edition 15:53), Chazon Ovadia Shabbat Part 5 page 68 also says it's worthwhile to be stringent. ↑ Shemirat Shabbat KeHilchata (in the new edition 15:53), 39 Melachos (Rabbi Ribiat, vol 3, pg 799). Shiltei Giborim 41b writes that a double knot might be a professional knot because it is a strong knot. Thus, Rama 317:1 forbids tying a double knot even if it is not meant to last. Many Ashkenazic authorities, including Kitzur S”A 80:45, Mishna Brurah 317:14, Shemirat Shabbat KeHilchata 15:52 and The 39 Melachos (vol 3, p. 792) agree, while the Aruch HaShulchan 317:10 disagrees. However, the Chida in Birkei Yosef 317:1 writes that in his locale, almost no one was strict for this Rama. Ben Ish Chai in Rav Pe’alim 2:44 explains that the Chida meant that the minhag is incorrect but that one need not protest. Thus, Ben Ish Chai (Ki Teitzei #2) forbids tying a double knot. Yalkut Yosef 317:8 argues that the Chida meant that Sephardim consider a double knot to be a non-professional knot and it may be tied if it is not meant to last. This is also the conclusion in Chazon Ovadia Part 5 page 57 that in time of need one may be lenient. The Magen Avraham 317:4 (according to the Pri Megadim and Levushei Sarad, unlike the Machasit HaShekel) writes that the only issue with the double knot is that it might be a professional knot because it is tight. If, however, one were to tie a loose double knot, it would be permitted. Similarly, Kaf HaChaim 317:23 explains that the Chida was only lenient if it is a loose double knot. Menuchat Ahava (vol 3, 14:5) agrees for a different reason. Shemirat Shabbat KeHilchata 15:55 rules that it is permitted to tie a loose double knot if it is meant to come undone within one day. He clarifies that loose means that it is able to become undone by itself. The Shabbos Home (vol 1, p. 207) agrees. ↑ Shemirat Shabbat Kahilchata 15:67 in name of Rav Shlomo Zalman Aurbach, Az Nidberu 1:58. ↑ Shemirat Shabbat Kahilchata 15:64 in name of Rav Shlomo Zalman Aurbach, Bier Moshe 1:22. ↑ Rav Ovadya Yosef in the Haskama of Netiv Mitzvot, Mayim Chaim Meshash O”C 1:147, Bier Moshe 2:20(2),6:59, Tefilah LeMoshe 1:58. This page was last edited on 16 May 2018, at 23:20.